Coz with John Shirreffs, June 2014. Photo by Kyle Acebo. How do you decide which horses will work in company? A:There are several factors to consider: age, fitness, and length of stride. You want the horses to be compatible as workmates and you do not want one horse more stressed than the other. Consider it like dancing and both horses are “in-step” when working. What are the indicators or signs that let you know a horse is 100% ready to race for the first time? A: When a horse has trained hard enough to run and off of that training he shows you he wants to do more, this is a good sign. The feed tub is also a great indicator as to how the horse is handling and internalizing his work load. When the feed tub is “licked clean” each morning, a horse is ready to run. Has Coz had the pleasure of drinking Guinness? Does he like certain foods? A: Coz is not “old” enough yet for beer (ha-ha). He has fresh carrot juice three to four times a week. John makes this for Coz at the barn and he drinks it out of a large salad bowl (this was one of Giacomo’s favorites as well). Coz also enjoys the Horse Apple Cookies that Mrs. Moss sends to the barn for him and his pals. Dam of Orfevre dies from perforated uterus following the delivery of a filly and full sibling to Orfevre. Condolences to all connections. Did the foal survive? Sure do miss you! Hope your computer gets well soon so we can have you back here with us. Take care! The reason those we love have so much more power to hurt us is because we are open to them. When we trust in full confidence we are without the usual protection we keep around us for those we do not trust. Never accept words meant to hurt. Turn them back because they are the responsibility of the speaker. When you are caught off guard, hold the emotions in silence for a moment and tell them to be still. It takes longer to forget than it does to forgive-and tie heals when we give it the power. We are all missing you and hoping all is well. Take care and get back with us as soon as you can. Racing is really gearing up now and we need to talk about with you. Oh my gosh, I remembered your birthday was coming up and then it slipped my mind yesterday. Oh, I feel so bad that I missed wishing you a Happy Birthday on your special day. You are very special to all of us, Coz!!! Many of us were up all night waiting for the news that you arrived!!!! When the first pictures of you were posted, we all melted over how precious you looked that little colt lying in the hay with your Mom!! Happy Belated Birthday! I hope you got lots of treats and a special birthday cake. I know John was very busy on Saturday, So, maybe everyone at the barn had a chance to help you celebrate your special day on Sunday. Dear Kathy.Welcome home!Hope you had a great weekend.Our short-lived spring sunshine has disappeared and the wet weather has returned.I hope it moves over to Cheltenham for the Fly! There was a sad postscript to Crufts with the death of a Belgian red setter called Jagger accusations of poisoning.They are waiting for the toxicology reports next week.So much rivalry in these shows and ambitious owners.It seems a few other dogs who took part that day have become ill too.Very sad.All our furbabies are pretty well I will be glad when Miss Kitty gets her tests she is obviously not well.Nerissa hasn’t been very well either losing weight and tummy troubles so the doc stole a lot of his blood last week(he even put out an APB)it turns out he has a problem with his thyroid and is now taking little pink pills!He is wonderful at taking his meds.I really hope he improves he will be 12 next month.Haven said the snow is starting to melt at long last!Gosh,Mango had another load of onesies yesterday and Judy has busy they are getting a new outdoor kitchen.Beautiful video of Ray washing his brother Hawley !Did you see Finn and his girlfriend Penster?they know it’s Monday too so I am off to turtle-turtle!Getting very excited about the festival! !Have a good day.Love and hugs to you,Kisses for Holly,Nikko and Sugar.Sheena. That is so unbelievable about Jagger. They’re covering this on the front page of The New York Times. The weekend was nice, now back to work. Went to bed early as I was tired from all the driving. We lost an hour over the weekend, Daylight Savings time. We always feel like zombies until we get used to the time change. Sorry your sunshine is gone for now. That’s awful about the possible poisoning of Jagger. Same thing happened to a beautiful Samoyed a few years back at the Westminster dog show. Glad to hear the FB furbabies are doing well. I hope they get Miss Kitty’s results soon and can help her. Sorry Nerissa isn’t well. That’s good the snow at Haven’s house is melting. Gosh, Mango sure gets a lot of clothes! I hope they donate some of them to shelters. I’m sure they probably do. An outdoor kitchen! How wonderful! Will check out the video on Ray’s page. I did see all the rat pics. So cute!!! They have the right idea to hide on Mondays. Get ready for the festival and have a good day. Love and hugs from me, kisses from Holly, Nikko and Sugar. Kathy. I was at Santa Anita on Saturday morning ordering breakfast at Clocker’s Corner when a friend came to me and said I just saw Coz, and she showed me her pictures! I just missed you! There’s a gorgeous photo of Zenny in the snow on her facebook page — don’t miss it. Cannot look at her without smiling! Coz is nominated for the Santa Anita Derby. Is it very likely a horse will just jump right in to a stakes race? It happens rarely, but it’s highly unlikely, especially putting a horse in a G1 for his first start. OK, I looked at the early nominations. They closed back on December 28, 2014, when we all thought Coz would be making a start soon. At the time, it was a sensible thing to do, especially since the nomination also covered three other stakes races (all of which have been run this year). However, the list of nominees is long. For actual entry, graded stakes winners are preferred, with the rest of the field to be filled according to winnings in non-stakes races. Since Coz has zero earnings, it seems to me certain that he wouldn’t make the gate, even if John actually wanted to run him. 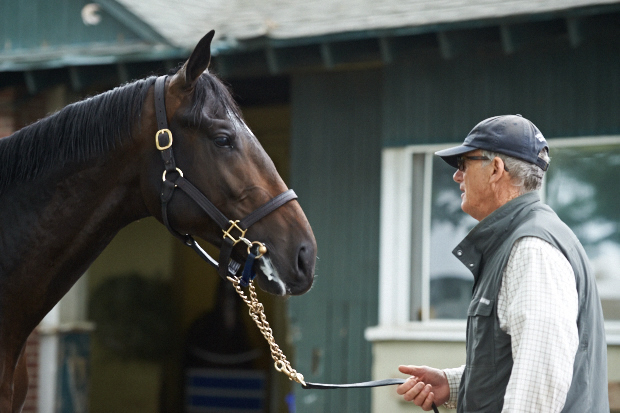 Have you made any decisions regarding who Zenyatta will be bred to this season? Sorry if this is a repeat question, I may have missed an earlier post. Do you put her under lights or allow nature to take its course. We’ve had good luck with the use of lights. She’s going back to War Front.